Website security is a contentious topic. Multinational corporations, government agencies and local businesses have all been hit with security issues in recent years, and the threats still keep coming. Despite catering to millions of users, big name web development platforms have been plagued by hackers, with many forced to offer last-minute updates in order to try and prevent a full-scale crisis. With major content management systems, such as Drupal and WordPress, facing on-going security concerns, many site owners are on the lookout for a more reliable option. Freshly launched Siteglide is just that. Built on Amazon AWS, Siteglide offers a secure and reliable platform to developers, agencies and business owners alike. With an SLA guaranteeing 99.99% uptime, we keep sites running without the need for constant updates. Many content management systems enable plugins in order to provide developers with increased options. Although this may work in theory, the practical implications of the framework have been questionable at best. In reality, the use of plugins creates a crack in which hackers can gain access to a site’s framework. Once access has been gained, hackers can modify a site, steal consumer and business data or even shut the site down altogether. In order to provide an impenetrable framework, Siteglide doesn’t use plugins. Instead, Siteglide’s features are built into the core web development structures. While developers have access to the latest tools, we’ll never compromise security by allowing vulnerable plugins to put your site or your clients at risk. As well as being a secure web development platform, Siteglide negates the need for technical knowledge. 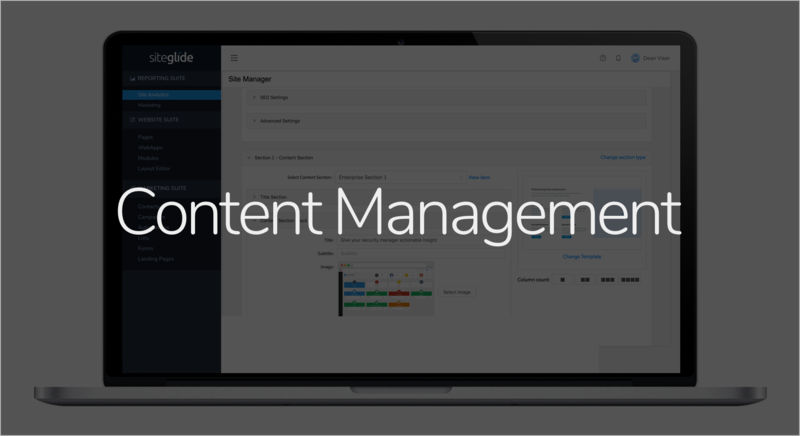 If you’re managing your own site or maintaining a web presence on behalf of numerous clients, Siteglide will allow you to modify content in a matter of seconds. Operating as a full-service management suite, users can add or delete new sections to websites, edit existing pages and even change the site layout with Siteglide’s user friendly interface. 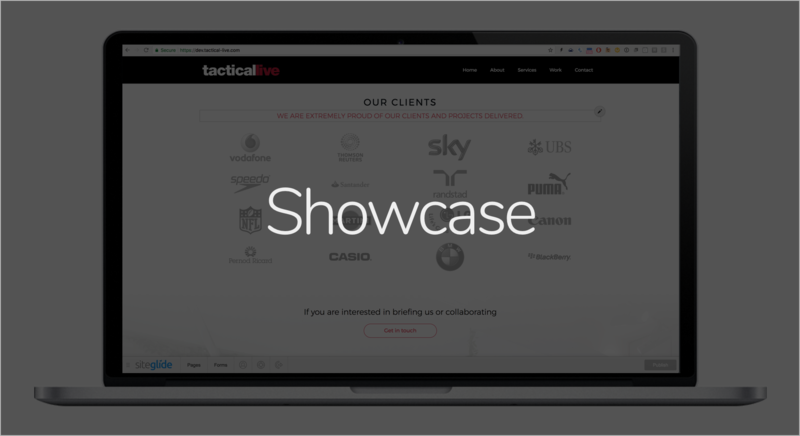 For agencies and site owners, this level of control reduces costs and enables you to be at the forefront of your industry. Breaking news to your industry needn’t be passed through various personnel before going live on your site. Instead, you can update your website with the latest information, whenever and wherever you are. Although Siteglide operates as a web development platform, it offers so much more than a mere web presence. As well as updating websites via Siteglide’s Page Builder, you can manage digital marketing campaigns and increase the reach of the site. With a dedicated customer relationship management (CRM) system, businesses can collect data from their site and schedule marketing communications at regular intervals. With the option to add subscriptions, lead generators and contact forms to sites, Siteglide enables users to collate data from a variety of sources. By inputting customer and client details directly into the CRM, you can be sure all data is stored securely, in one place. In addition to this, Siteglide makes it easy to provide relevant content to consumers and clients. Segmented lists will ensure you can see what users have signed up for, so you can provide them with relevant marketing content. 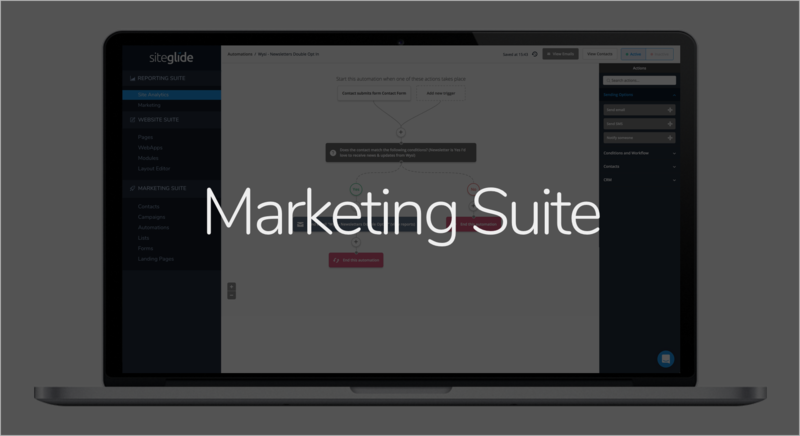 What’s more – Siteglide ensures your marketing activity is fully GDPR compliant. When you’re managing campaigns or launching a new marketing tool, Siteglide’s Contact Activity will confirm the subscriber’s consent, ensuring you’re always compliant with the new data regulations. To find out more about Siteglide and how it can benefit you, contact us today.